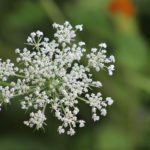 Can I grow Queen Anne\'s lace in a container garden? What other types of butterfly-friendly plants are good for container gardens? Thanks! Yes, you can grow them in container. Just remember to get a container that is fairly deep, as these are actually a species of carrot, and will require similar care. They will grow only leaves the first year, and flower the second.